Coyote Hill is a hybrid between traditional foster care and residential care in that the children live in families comprised of two Behavioral Specialists (Home Parents.) Each family is equipped with all of the support needed to help break the vicious cycle of abuse and neglect and instead, instill cycles of success by modeling healthy parental, marital, and community-enriching behaviors. Coyote Hill works with broken families of today while working to build successful individuals and families of tomorrow. Coyote Hill fills a unique niche in mid-Missouri. Foster parents can lack the training and supports to deal with unique placements (children with behavioral issues, sibling groups, or handicaps.) On the opposing spectrum, a residential care facility with shift staff provides a child with those professional support systems, but lacks a traditional, family setting. Coyote Hill bridges the gap through a Blended Family Home Life. A hybrid between traditional foster care and residential care, our children live in families comprised of Home Parents. Our Home Parents are highly-trained spousal foster parents who engage continually in professional development and skill building for working with high-risk children, with up to eight abused or neglected children in each of our traditional family homes. Coyote Hill equips each family with all of the support needed to help break the vicious cycle of abuse and neglect. An advantage Coyote Hill holds over most single-family home placements services is their blended family environment, which allows us to serve sibling groups that may otherwise be split apart. 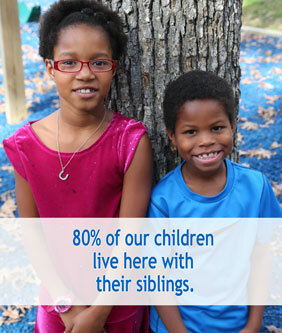 Many foster homes are not able to care for siblings, whereas Coyote Hill often accepts sibling groups. Because all of the supports are built into the programming at Coyote Hill, siblings with varying ranges of behavioral needs can live together in a co-ed, traditional family home instead of being sent to separate foster homes. For siblings entering care, being placed together can enhance their sense of safety and well-being. Siblings placed together also provide natural support to each other following the trauma of being separated from parents.